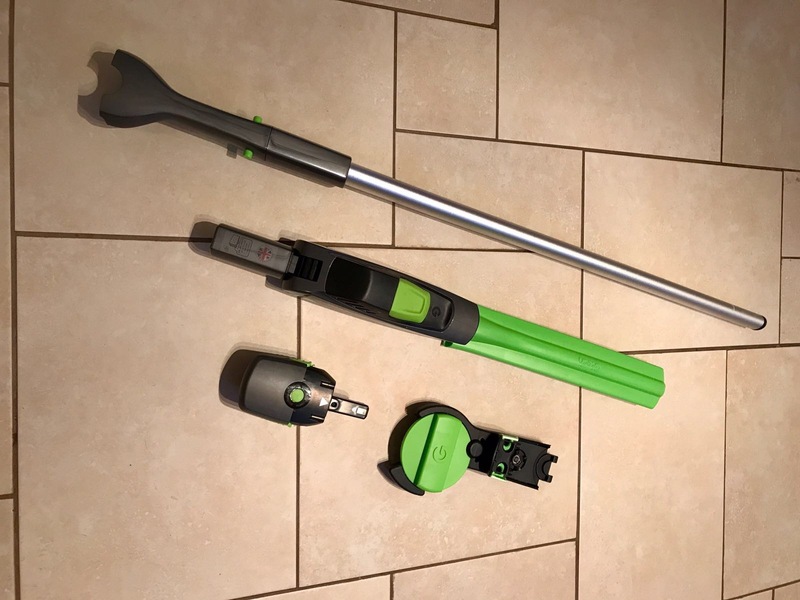 Recently Mrs B asked me to do another review for the blog, and this time up we have some great new tech from Gtech (is that what the G stands for – great?). 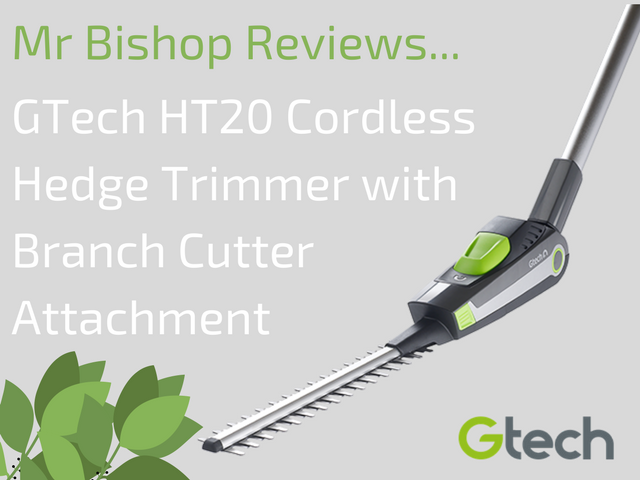 It’s the Gtech HT20 Cordless Hedge Trimmer and Branch Cutter attachment. Mrs B has previously reviewed the cordless vacumn cleaner from Gtech, so we are already big fans of the brand and know they do some quality stuff. On the assumption the cordless hedge trimmer was anything like the vacumn cleaner then we had high hopes! 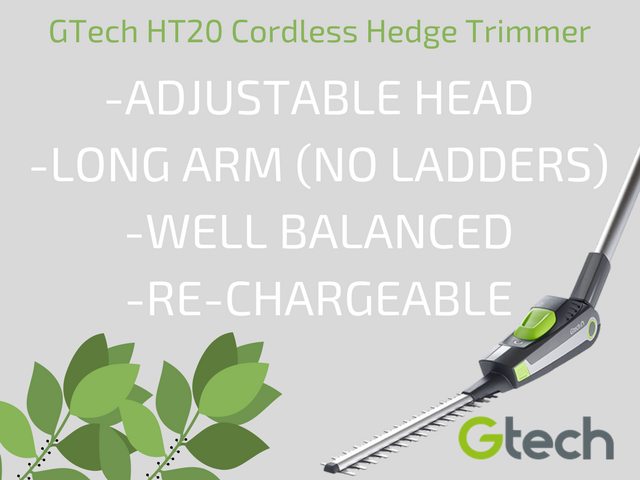 The GTech HT20 Cordless Hedge Trimmer currently retails at £129.00 with £20.00 add on fee if you want the branch cutter attachment too, so it's a fairly pricey piece of kit...another reason for high expectations. I do like doing gardening, but obviously the main hurdles are a) it takes ages, and b) it's knackering. So anything that is going to make it easier is a bonus. 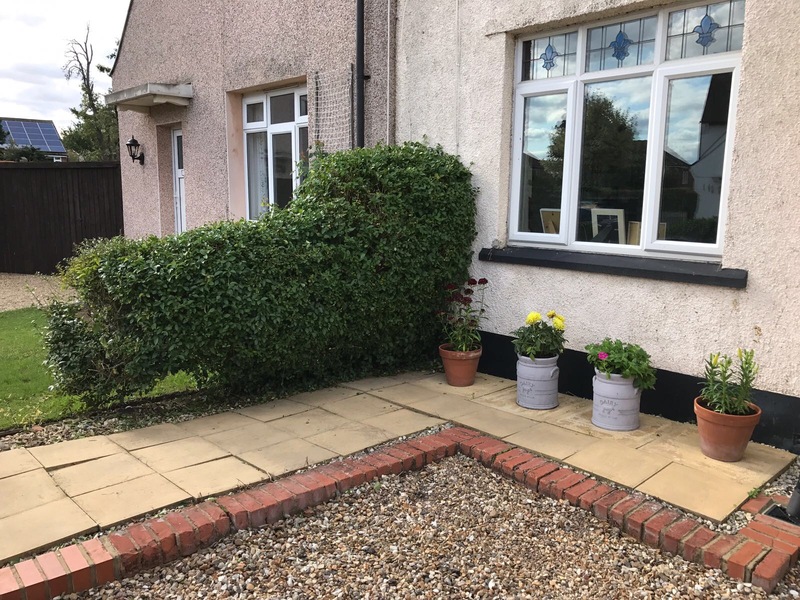 Previously when I cut the garden hedges I’ve used some 10 year old, slightly rusty hand shears – hence the taking ages and getting tired doing it. So I was excited to put some power into the job and see how it turned out! 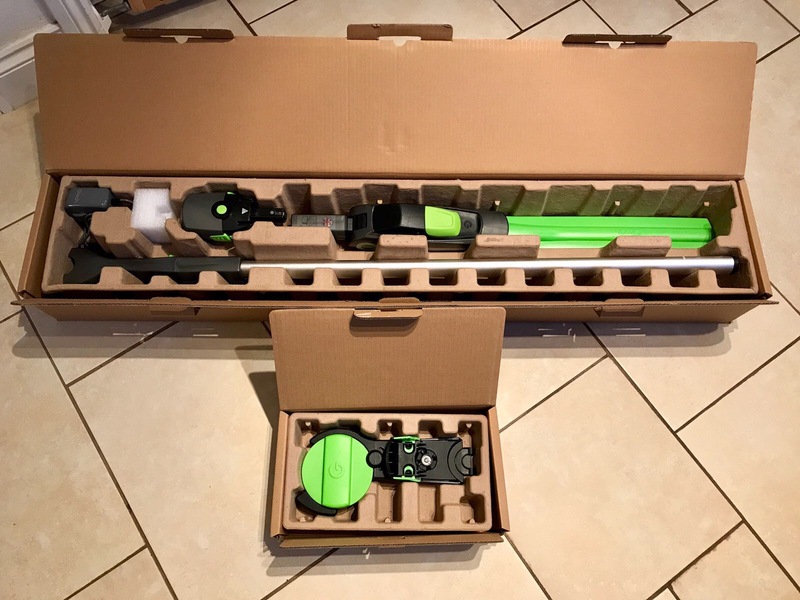 When I first opened the Gtech I was surprised how simply it was all boxed up. Everything has its place in a cardboard holder, and I could see that this would double up as a handy place to keep it all when not in use. It also seemed quite small and not at all bulky – it’s a really compact piece of kit. And that’s it. What else do you need? I didn’t even need the instructions to put it all together – I had worked it out and assembled by myself in about 20 seconds! There are only 3 main bits and they just clip together quickly and easily. But considering I was dealing with something that I could potentially cut my own arm off with (maybe), I thought I had better read through the instructions anyway to be safe...! 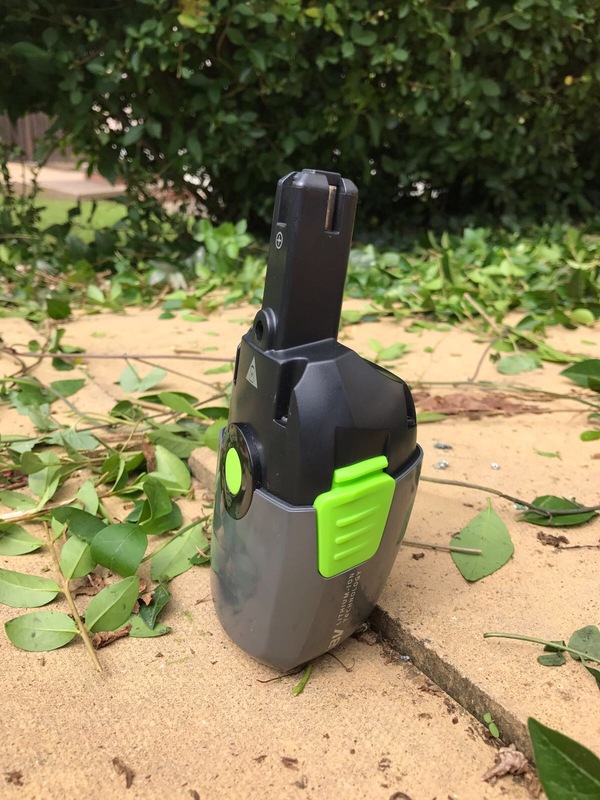 There was some really useful info in there about how to trim hedges, techniques and troubleshooting etc, but basically it’s so simple to put together and use that it really doesn’t need any instructions. I just charged up the battery for a few hours ready for use the next day and I was all set! In fact the battery takes just 4 hours to charge which is really swift! 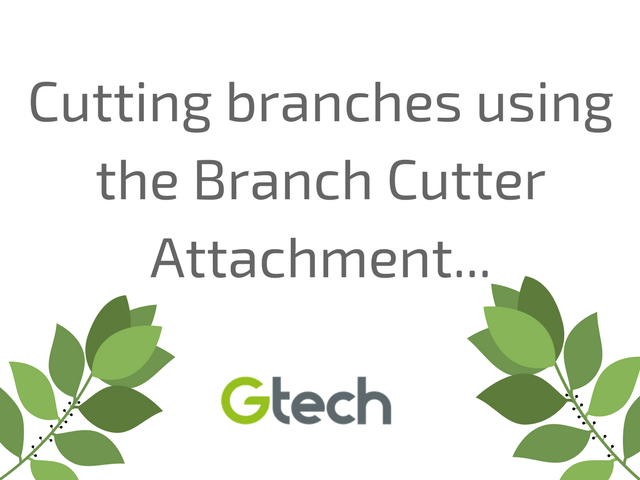 We also had the additional branch cutter attachment. This uses the same battery and base unit as the trimmer, so you just unclip the hedge trimmer head and clip in the branch trimmer head and that’s it. Nothing to screw or unscrew or lose, it’s simple as! Because of the Summer weather, I had to wait 2 weeks while The Perfect Storm died down outside, but when the clouds cleared, I jumped to it and was ready to use my new toy tool. The first thing about the trimmer I noticed is that it’s a good weight. I would have expected a battery pack and motor to be really heavy, and as I would potentially be swinging this pole around for a while, I was worried it would tire my arms quickly. But it was surprisingly movable and well balanaced with the weight of the cutter on one end and the battery at the other. The pole is strong but hollow as well, and has great reach on it. There is no cord so you don’t have to worry about tripping up and falling in the bush/through a fence/smashing a window etc. I’ve spent many years using corded power tools and grass mowers etc and having the threat of cutting through a wire and having a REALLY bad day, so to go cordless have a certain sense of freedom was ace. The cutting head has an adjustable angle on it as well, all the way through 135º, which with the push of a button you can change immediately with minimal fuss, so combined with the long pole you can manoeuvre it to cut all those hard to reach places without having to really bend down or stretch (good for the back). There is a safety catch on the handle next to the trigger (again, safety is good – I like my arms!) so you can’t start it by accident and HAVE an accident. I started it up and got going. It’s really not very loud, I was worried it would be like a petrol trimmer and explode my eardrums when I started it, but it’s no noisier than your vacumn cleaner really – not even the cat was bothered. 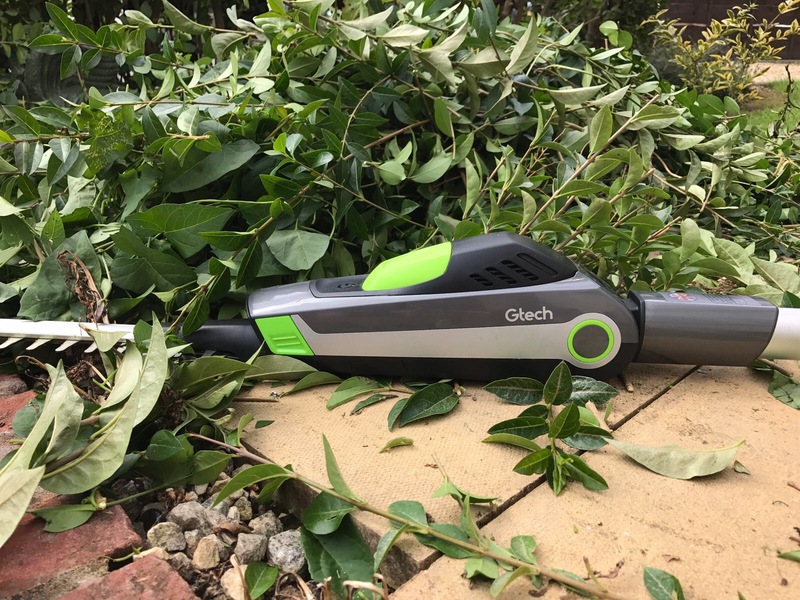 The cutting blades didn’t move that quick, so with the light weight I was worried it wouldn’t be that powerful, but I was wrong – it’s brilliantly powerful. As I started cutting it literally went through the hedge like butter. It just chugged away and cut whatever part of the hedge it came into contact with easily! I felt like a sculpter, just carving away at a block of ice or wood creating a masterpiece. Within a few minutes I had done the whole of my front hedge! Like pressure washing, it’s extremely satisfying to use. 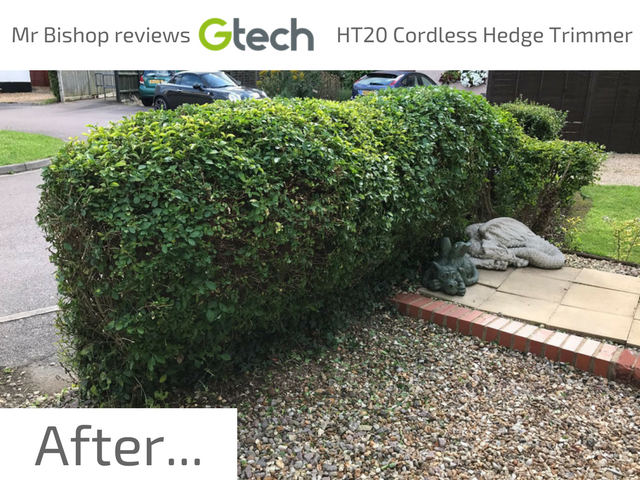 I was able to cut the hedge back to a smooth shape quickly and easily, and I got a much smaller neater shape than I ever have before. Alan Titchmarsh would have been proud. A job that previously took half a hour and left me sweaty, tired, swearing, and with sore limbs, had now taken less than 5 and I hadn’t even broken a sweat. Amazing. 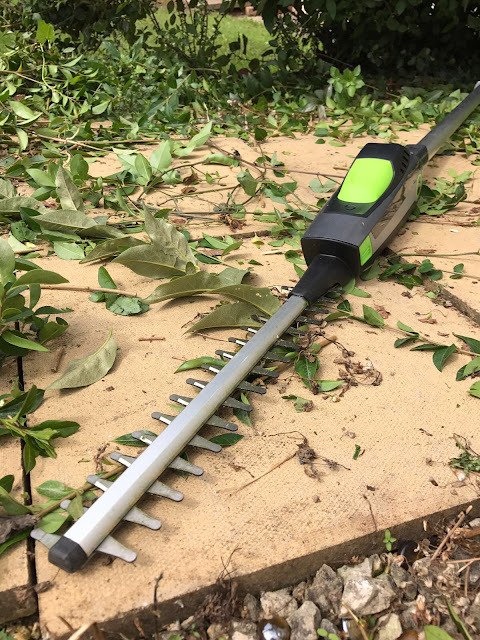 As I mentioned before, the fact that it’s cordless as well meant no wires to cut through and electrocute myself, and left me free to use the adjustable head and long pole to easily reach all areas of the hedge with minimal effort. I went straight into the next hedge in the garden and finished that easily too. Then onto the back garden and I did all those too! I got a bit carried away, I wanted to go into my neighbours and do theirs also. After the hedges, I went on to try the branch cutter. I swapped over the heads in around 5 seconds and was using it straight away. A few weeks ago I cut down some branches in the garden, using a normal handsaw, a wobbly ladder, and a lot of graft and sweat. At one point Mrs B came into the garden and said, and I quote, that it looked ‘extremely dangerous’. Apart from the dangers of standing on a ladder directly underneath a heavy wooden branch and cutting it off, it’s also really hard work using a saw on thick branches, so sawdust would fall down into my eyes, and stick my my bald sweaty head. Delightful. Anyway, because of the weight of the branch trimmer and the length of the pole, there were no ladders today and I could reach all the branches I couldn’t reach a few weeks ago so I could do a proper job. The trimmer was so quick cutting through them! It cut through all the branches in mere seconds with a minimum of sawdust (if any). I did have an image of my arms killing me while I was standing there holding a long pole in the air for 20-30 seconds while the blade did the cutting, grimacing like a red face idiot; but even the bigger branches took no longer than 5 seconds to cut. So no achey arms, no exhaustion, no red face, no head covered in sawdust and eyes full of splinters. The saw has a little resting part sticking out, so you can either push up into the branch, or sort of hook it on the branch and pull down. It’s a really clever piece of kit. We have an old pear tree in our garden that produces rock hard, inedible and probably mildy poisonous pears you absolutely can’t eat, that every year blocks out the sun and leaves mouldy rotton pears all over the grass, so I spent quite a while trimming all those branches down, opening up the space and letting more light in. I honestly don’t know how long it would have taken and what dangers I would have faced down had I had to climb up there with a ladder and handsaw to do the job. 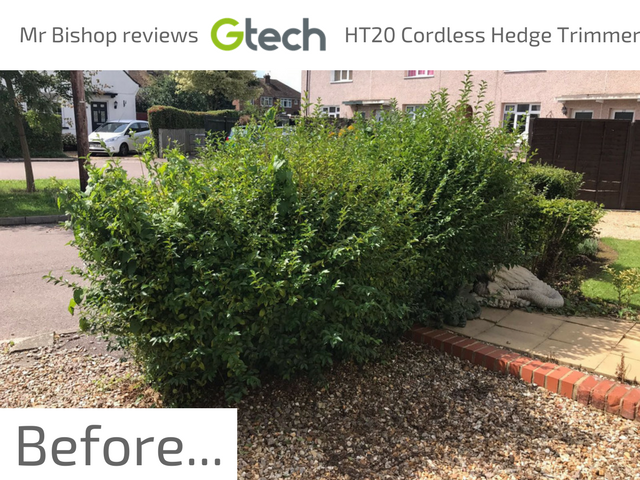 By the time I had done that the battery was just ending, and with 45 minutes of usage time, I had got all the hedges in both gardens right down, and all the trees trimmed down massively. In 45 minites I achieved what previously would have taken me most of a day and exhausted me to the point of not bothering to do the rest of the gardening. I had so much time left of the gardening day that I then had time and energy to go to tidying up properly (like I said, I usually half-arse it), go to the garden centre to get some new plants and seeds, plant them, clean up the stones on the drive way, mow the lawn AND have a cup of coffee and chat to my neighbour. A much neater front garden, with flowers and everything! We are no longer a disgrace to our street - hooray! Once I’d finished, I popped the hard plastic covers back over the blades, and slotted the trimmer and the attachments back into their boxes and stored them away with minimal effort. Win! 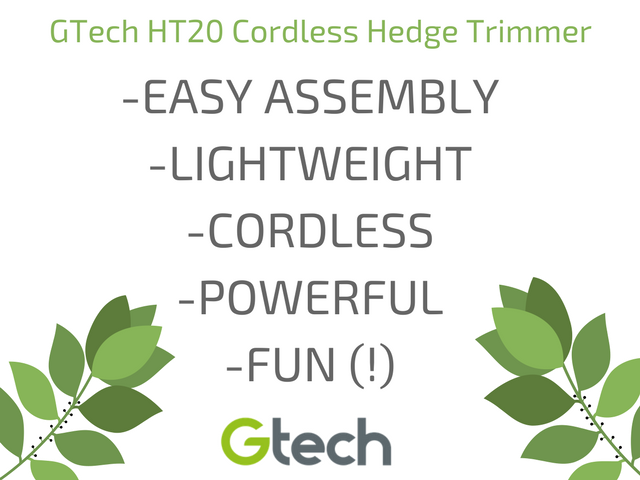 Overall I was massively pleased with the Gtech HT20 Cordless Hedge Trimmer. I hadn’t imagined using something like that would make my life that much easier but it really did. It made the garden look great and was so easy to use. I really couldn’t fault it at all. I highly recommend! 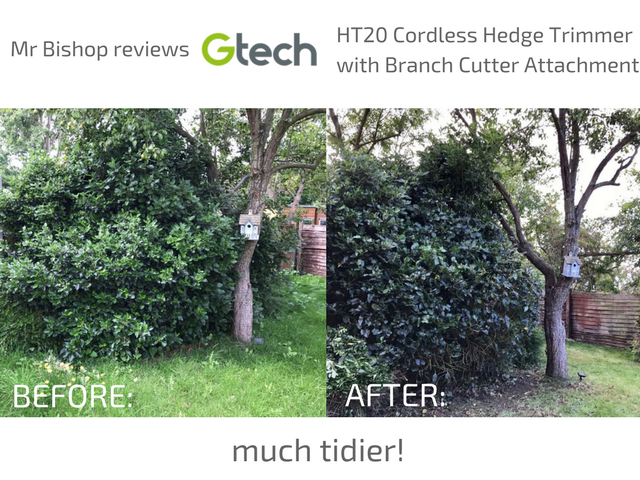 Do you have a hedge trimmer? Which type do you prefer to use? Have you ever thought about going cordless? 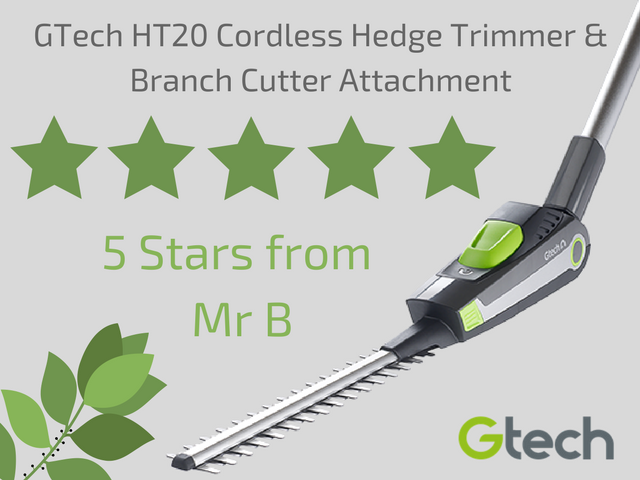 We were sent the cordless hedge trimmer with branch cutting attachment in exchange for this honest review. The Milwaukee® M18 FUEL™ 16" Chainsaw conveys the ability to cut hardwoods, cuts quicker than gas, and conveys up to 150 cuts for each charge. The unit is intended to meet the execution, strength and ergonomic needs of expert scene upkeep, control utility, and the introduced M18™ client. The POWERSTATE™ Brushless Motor keeps up speed under overwhelming burdens without stalling to beat little gas motors and higher voltage frameworks. REDLINK PLUS™ knowledge guarantees most extreme execution and insurance from over-burden, overheating and over release.